This workshop is particularly timely, given that the European IORP II directive comes into effect in January 2019 for Irish pension schemes, requiring trustees to disclose how they consider the Environmental, Social and Governance (ESG) criteria in their investment decision-making processes. The last blog I wrote – on the theme of impact investing and my own experience in Latin America – was concluded with a clear message, Intention is never enough! As I said, I want to be part of this process of evolution for the better in the way we think about business and investment, to assist companies and investors in finding practical ways to apply a responsible philosophy that can explicitly integrate the concept of impact. I think we should all be asking ourselves the question: how can we as individuals, given our education and/or experiences, influence change for the better? I am a believer in the idea that small changes at an individual level can deliver a meaningful collective impact over time. For me, it came down to how best I could share my learnings from my experience in Latin America over the last 18 months, the new perspectives and knowledge that have augmented my previous 12 years or so of advisory experience. Working in impact investment in Guatemala and the time I have given since to meeting people in the sector, and researching and writing on this theme and the broader responsible investing landscape, has helped me to conceptualise my own thoughts on how we can arrive at pragmatic ways to apply the concept of impact across all investments. Now it is time to share those ideas and provoke discussion among clients on how we think about business and investment. 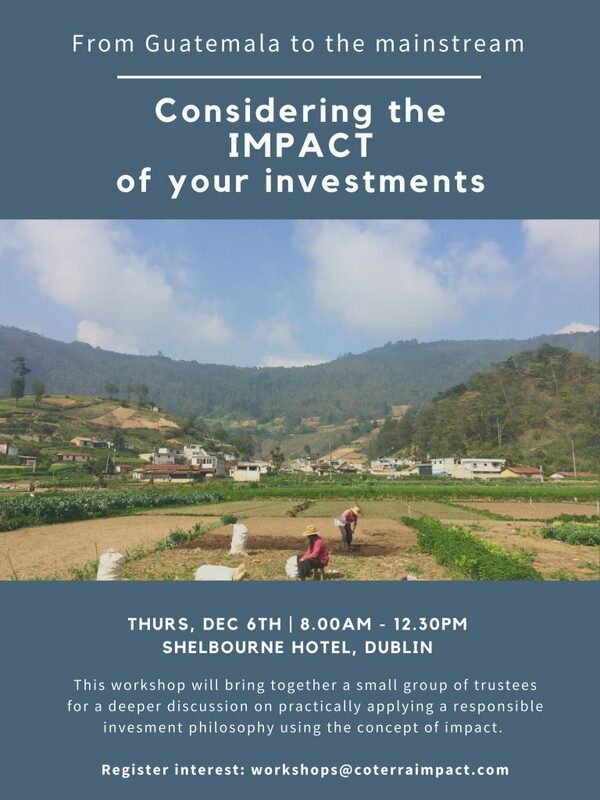 So, I am excited to be sharing the news that I will be back in Dublin in December, bringing together a small group of trustees for a workshop on considering the impact of investments, a deeper dialogue on practically applying a responsible investment philosophy. The reality is that regulators globally are beginning to demand more of trustee boards on how they incorporate the ESG criteria into their investment decision making and apply more responsible investment policy. Trustee boards and advisors have a choice, tick a box and wait for more regulation or take the lead and push for genuine change. This workshop is intended to engage trustees on this challenge, to provoke discussion and to empower them to ask more of investment consultants and investment managers and to be prepared for leading discussions with regulators and government bodies. (FYI, where called upon the Pension Authority will require trustees to attend meetings without their consultants to discuss the application of the IORP II directive). If retirement planning is about saving and investing to secure a future lifestyle in retirement, then it makes perfect sense that the impact of investments on stakeholders and the environment should be explicitly considered. It is not about sacrificing returns, it is about delivering more sustainable returns and in turn securing the future of our ecosystem. Trillions of dollars are invested across pension schemes globally largely based on backward-looking risk and return data. Incorporating the concept of impact is about taking a more forward-looking approach. It can also be a way of working towards aligning the values of the pension scheme with the values of its members. If you are a trustee (or perhaps a business owner/executive responsible for the company pension scheme) interested in being part of this discussion, please get in touch and I can share more details on the workshop. For pension scheme members, please forward to your member trustee representative. Gracias!